The 1958 Buick Fireball V-8 engines used in all series are of the same basic design, differing only in compression ratio, power, carburetor equipment and intake and exhaust manifolds. An important feature is the interchangeability of almost all parts. All series use the same basic engine with a bore of 4.125″, a stroke of 3.4″ and piston displacement of 364 cubic inches. The 1958 Buick Synchromesh engine (Series 40) is equipped with a cast iron flywheel for clutch application and the engines used with the Dynaflow transmission have a steel flywheel for torque converter application. The following variations are used to adapt the basic design to the various series and transmission applications. 1958 Buick Series 40 Engines. These engines are equipped with 2-port intake manifolds and 2- barrel carburetors. The Synchromesh engine has a compression ratio of 8.0 to 1 and the Flight Pitch and Variable Pitch Dynaflow engines have compression ratios of 9.5 to 1. The lower ratio of the Synchromesh engine is obtained by using pistons having different dome heights. Both engines use steel cylinder head gaskets .015” thick. 1958 Buick Series 50-60-70-700 Engines. These engines are equipped with 4-port manifolds and 4-barrel carburetors. Synchromesh is not available on Series 50-60-70-700 cars. The engine used has a compression ratio of 10 to 1. This engine also uses .015″ steel head gaskets. IMPORTANT NOTE: Some 50-60-70-700 engine s built for use in hilly country, where the anti-knock quality of gasoline occasionally is below normal, are equipped with 9.5 to 1 compression ratio pistons. Engines so equipped are identified with a letter” X” stamped as a prefix to the production code number. The 1958 Buick engine and transmission assembly is supported in the frame on three synthetic rubber pads. One mounting pad is located on each side of the engine near the front end and approximately midway between top and bottom of the cylinder crankcase. The mounting pads are fastened between the crankcase and the cross member at front end of car frame. The front mountings are designed to support the weight of the 1958 Buick engine and control its torsional characteristics. See figure 2-2. Synchromesh and Variable Pitch Dynaflow mountings. The rear (transmission) mountings of synchromesh and variable pitch Dynaflow equipped cars are composed of two parts-a mounting pad to support part of the weight of the 1958 Buick engine and transmission assembly and a thrust pad to take the drive thrust from the rear wheels. 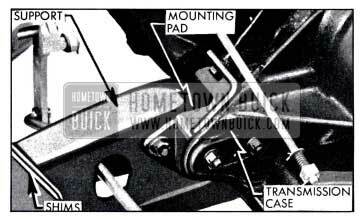 The mounting pad is located between the transmission rear bearing retainer and the transmission support. 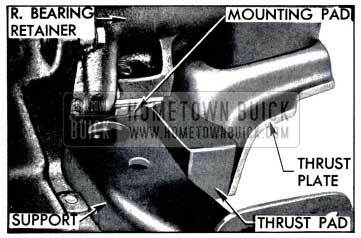 The thrust pad is located between the rear edge of transmission support and a thrust plate extended downward from the rear bearing retainer. See Figure 2-3. Flight Pitch Dynaflow mountings. The rear (transmission) mountings of Flight-Pitch Dynaflow equipped cars are composed of two parts, one at each side of the transmission case and to the rear of the transmission support. The mounts are angularly mounted so rotation of the 1958 Buick engine and transmission assembly is taken in shear by the transmission mounts while thrust from the rear wheels is taken in compression. See Figure 2.4. The 1958 Buick cylinder crankcase has two banks of four cylinders each, which form a 90 degree angle. The crankcase section extends below the centerline of the 1958 Buick crankshaft to form a continuous flat surface with the rear bearing cap and the timing chain cover, permitting installation of the lower crankcase with a one-piece gasket. The upper portion of the flywheel housing is cast integral with the cylinder crankcase. The right bank of cylinders (as viewed from rear) is set slightly forward of the left bank so that connecting rods of opposite pairs of cylinders can be connected to the same crankpin. Starting at front end, cylinders in the right bank are numbered 1-3-5-7 and cylinders in the left bank are numbered 2-4-6-8. The 1958 Buick crankshaft is supported in the crankcase by five steel-backed full precision type bearings, all having the same nominal diameter. The first four bearings are identical, but the rear bearing is longer and flanged at both ends to match flanges on the crankshaft which control end thrust. See figure 2-6. The 1958 Buick crankshaft is counterbalanced by weights forged integral with crank cheeks. Maximum counterweighting in the space available is obtained by machining the weights to a contour which allows a minimum uniform clearance with cylinder barrels and piston skirts. Additional counterbalancing is obtained by an offset flywheel flange. 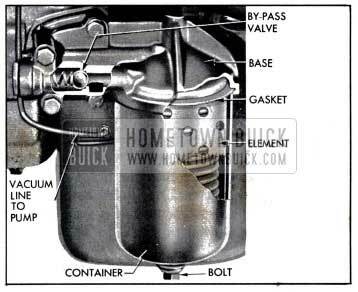 All 1958 Buick engines are equipped with a harmonic balancer and fan pulley assembly. 1958 Buick connecting rods are steel drop forgings of 1-beam section, having bosses on each side so that metal can be removed as required to secure correct weight and balance during manufacture. The lower end of each rod is fitted with a steelbacked full precision type bearing. The upper end of the connecting rod has a hole into which the wrist pin is pressed. The outer ends of the pin float in the bosses in the piston. The tin plated aluminum alloy pistons have full skirts and are cam ground. Two compression rings and one oil control ring are located above the piston pin. Two transverse slots in the oil ring groove extend through the piston wall and permit drain back of oil collected by the oil ring. Shallow depressions cast into the head provide clearance between the piston and valves in operation. See figure 2-7. The cast iron compression rings in the two upper grooves of piston are distinguished by a small groove (a bevel on some rings) cut around the inner edge on one side, and this side must be toward bottom of piston when installed. See figure 2-37. The oil ring in the lower groove consists of two thin steel rails separated by a spacer (fig. 2-37) and backed by an expander placed in the piston groove. The rails and spacer of a new ring are lightly held together with a cement which dissolves and releases the parts when oil is applied at start of operation. Both 1958 Buick cylinder heads are identical except for treatment of the water inlet ports which exist in both ends of each head. When a head is prepared for installation on one bank of cylinders, the water inlet port on the rear end is plugged and the front port is left open for connection to the water pump. This places the plugs in opposite ends of the right and left heads; therefore, the heads cannot be interchanged. All valves are mounted vertically in the cylinder head and in line from front to rear, so they operate at 45 degrees to the centerline of 1958 Buick cylinders. The angle and location of the inlet valve and port causes the incoming fuel-air charge to sweep angularly downward to one side of the cylinder centerline, resulting in a whirling action which thoroughly mixes the charge and produces a beneficial turbulence during the compression stroke. With the 1958 Buick spark plug located centrally in top of the combustion chamber the point gap is well exposed to the sweep of the incoming charge. This reduces the concentration of exhaust gases that may have remained in this area after exhaust of the previous charge. As noncombustible exhaust products are removed from the area around the spark plug the tendency toward misfiring at part throttle is reduced. The central location of the spark plug causes burning of the fuel charge to proceed uniformly outward in all directions toward edges of the combustion space. The short flame travel speeds up the combustion process, causing the fuel mixture to burn in a shorter period of time than that at which detonation is likely to occur. High turbulence on the compression stroke and short flame travel following ignition permits the use of a high compression ratio with present day fuels. 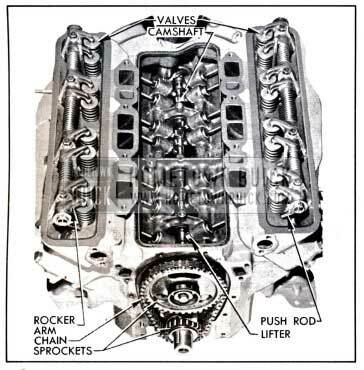 The 1958 Buick camshaft is located in the angle of the cylinder block above the 1958 Buick crankshaft where it is supported in five steel-backed, babbitt-lined bearings. It is driven from the crankshaft by sprockets and a single outside guide type chain. See figure 2-8. Hydraulic valve lifters and solid one-piece steel push rods are used to operate the overhead rocker arms and valves of both banks of cylinders from the single camshaft. This system requires no lash adjustment at time of assembly or in service; therefore, no adjusting studs or screws are provided in the valve train. Construction and operation of the hydraulic valve lifters are described in sub-paragraph f below. The eight rocker arms for each bank of cylinders are mounted on a tubular steel shaft supported on the cylinder head by four die cast brackets. The rocker arms are offset to accommodate the different planes of movement of the valves and the push rods which pass through the cylinder head to one side of the valves. The valves operate vertically in guides pressed into the cylinder head and each valve has two concentric springs to insure positive seating throughout the operating speed range. Inlet valve heads are 1 7/8″ and exhaust valve heads are 1 7/16″ in diameter. Valves and rocker arms are protected by a cover which seats against a raised horizontal surface on each cylinder head, and a cork gasket insures against oil leaks. 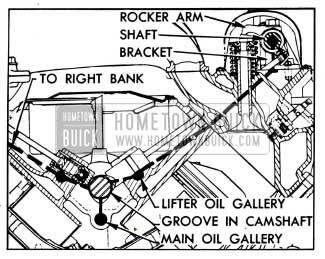 In addition to its normal function of a cam follower, each 1958 Buick hydraulic valve lifter also serves as an automatic adjuster which maintains zero lash in the valve operating linkage under all operating conditions. By eliminating all lash in the operating linkage and also providing a cushion of oil to absorb operating shocks, the hydraulic valve lifter promotes quiet valve operation. It also eliminates the need for periodic valve adjustment to compensate for wear of parts. As shown in figure 2-9, all parts of a hydraulic lifter are housed in the body, which is the cam follower. The body and the plunger are ground to very close limits, then a plunger is selectively fitted to each body to assure free movement with very little clearance. The push rod seat is free to move with the plunger in the body and, as its name implies, it provides a spherical seat to support the lower end of the push rod. The plunger and seat are pressed toward the upper end of the lifter body by a coil spring which also holds a check ball retainer against the lower end of the plunger. When lifter is out of engine a spring wire retainer holds all parts in the body. The ball retainer holds a check ball in position over the lower end of a feed hole in the plunger and limits its travel to .004″-.008″. See figure 2-9. When the valve lifter is installed in 1958 Buick engine the push rod holds the seat and plunger downward clear of the plunger retainer at all times. The plunger spring then presses the lifter body down against the camshaft and presses the plunger and seat up against the push rod with an eight pound load, which is enough to take up all lash clearances between parts in the valve linkage without affecting positive seating of the valve. Oil is fed to all lifters through galleries in the crankcase, as described in paragraph 2-6. 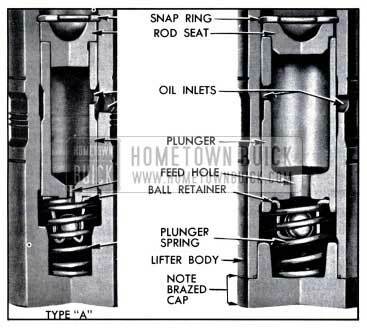 Oil enters each lifter through grooves and oil holes in the lifter body and plunger, and flows down into the chamber below the plunger through the feed hole in plunger. 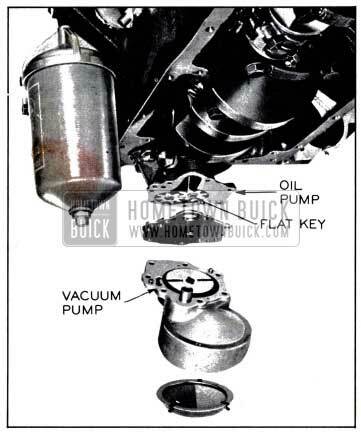 The first few cycles of operation after the 1958 Buick engine is started forces out all air and completely fills the plunger and lower chamber of each lifter with oil. At the start of a cycle of valve operation the lifter body rests on the camshaft base circle, the plunger spring holds all lash clearances out of the valve linkage, and the check ball rests on its retainer so that the plunger feed hole is open to permit passage of oil between the plunger and lower chamber. 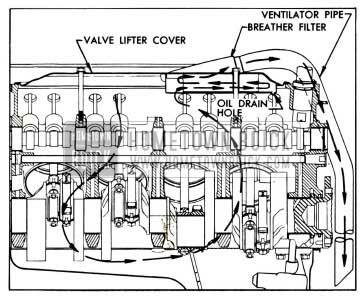 As the rotating camshaft starts raising the valve lifter body, oil in the lower chamber begins to flow through the open plunger feed hole but the flow immediately seats the check ball against the plunger to prevent appreciable loss of oil from the lower chamber. 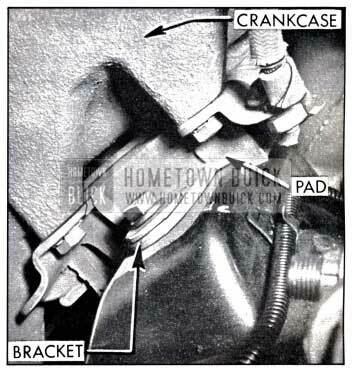 The lifting force against the body is then transmitted through the entrapped oil to the check ball and plunger so that the plunger and push rod seat move upward with the body to operate the linkage which opens the 1958 Buick engine valve. 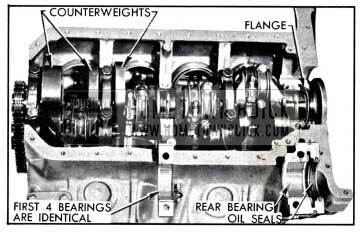 As the camshaft rotates further to close the 1958 Buick engine valve the valve spring forces the linkage and lifter to follow the cam down. When the engine valve seats, the linkage parts and lifter plunger stop but the plunger spring forces the body to follow the cam downward .002″ to .003″ until it again rests on the camshaft base circle. Oil pressure against the check ball ceases when the plunger stops, the check ball drops down against its retainer, and the plunger feed hole is again opened to permit passage of oil between plunger and lower chamber. During the valve opening and closing operation a very slight amount of oil escapes through the clearance between plunger and body and returns to the crankcase. This slight loss of oil (called “leakdown”) is beneficial in providing a gradual change of oil in the lifter, since fresh oil enters the lower chamber when the feed hole is opened at the end of each cycle of operation. It should be noted that during each cycle of operation the vertical movement between the body and plunger is only .002″ to .003″ but the check ball moves through its full travel of .004″ to .008″. Full opening of the plunger feed hole at the end of each cycle not only permits replacement of oil lost from the lower chamber, as previously described, but also permits control of the volume of oil in lower chamber to compensate for expansion and contraction of the valve linkage parts due to changes in engine temperature. When 1958 Buick engine temperature increases and the valve linkage parts expand, the plunger must move to a slightly lower position in the lifter body to assure full closing of the engine valve. When engine temperature decreases and the linkage parts contract, the plunger must move to a slightly higher position in body to prevent lash clearances in the valve linkage. In either case, the capacity of the lower chamber changes and the volume of oil present is automatically controlled by passage of oil through the open plunger feed hole. 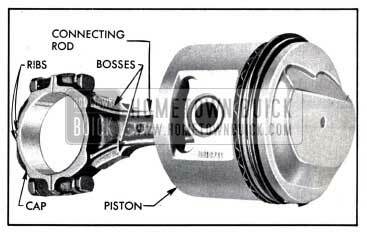 The 1958 Buick engine lubrication system is of the forcefeed type in which oil is supplied under full pressure to crankshaft, connecting rods, and camshaft bearings, and is supplied under controlled volume to the valve lifters, rocker arm bearings, and push rods. All other moving parts are lubricated by gravity flow or splash. Oil Supply. The supply of oil is carried in the lower crankcase (oil pan) which is filled through filler caps in the rocker arm covers. The filler openings are covered by combination filler and ventilating caps which contain filtering material to exclude dust. A removable oil gauge rod on right side of crankcase is provided for checking oil level. Oil Pump. Oil is picked up and circulated by the spur-geared oil pump section of the combined oil and vacuum pump assembly which is mounted on the lower side of the cylinder crankcase at the rear end, where it extends down into the oil sump. The pump shaft is coupled to the ignition distributor shaft, which is driven from the camshaft through spiral gears. The pump inlet is equipped with a stationary screen of ample area. If the screen should become clogged for any reason, oil may be drawn into the pump over the top edge of the screen, which is held slightly clear of the screen housing by three spring clips. The oil pump body contains a non-adjustable spring loaded pressure valve, which regulates the maximum oil pressure to 40 pounds. See figure 2-10. The oil pump driven gear drives the vacuum pump rotor by means of a flat key which extends down through the common pump cover plate. Drilled passages in the oil pump body and cylinder crankcase conduct all oil from the pump to the oil filter. Oil Filter. The AC full flow type oil filter is externally mounted on the right side of crankcase at the rear end. The filter contains a replaceable Aluvac filter element which permits rapid passage of oil with a minimum drop in pressure. Normally, ALL engine oil passes through the filter element. If the element becomes restricted enough to produce 4 1/2 to 5 1/2 pounds difference in press re between the inlet and outlet ports of the filter, a spring-loaded ball type valve in the filter base will open to , by-pass the element and route oil directly into the main oil gallery. See figure 2-11. Main Oil Gallery. The 1958 Buick main oil gallery runs full length of the crankcase in the angle below the camshaft. Through connecting passages drilled in the crankcase it distributes oil at full pressure to all crankshaft and camshaft bearings, from which oil is then distributed to all other working parts of the 1958 Buick engine. See figure 2-12. Crankshaft, Rods, and Pistons. Holes drilled in the crankshaft carry oil from the crankshaft bearings to the connecting rod bearings. 1958 Buick pistons and cylinder walls are lubricated by oil forced through a small notch in the bearing parting surface on connecting rod, which registers with the hole in the crankpin once in every revolution. Piston pins are lubricated by splash. Timing Chain and Sprockets. A small amount of oil which escapes from the camshaft front bearing flows down the front face of the cylinder crankcase. A sheet metal trough mounted on the crankcase causes the oil to drop on the crankshaft sprocket, from which it is then transferred to the timing chain. Valve Lifters and Oil Galleries. Oil holes in the crankcase and camshaft front bearing align with a groove in the camshaft front bearing journal which meters the flow of oil from the main oil gallery to the valve lifter oil gallery in each bank of cylinders. 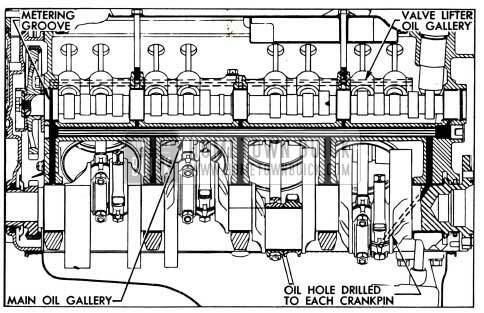 The drilled oil gallery, running full length of each cylinder bank, cuts into the lower sides of all valve lifter guide holes to supply an adequate volume of low pressure oil to each hydraulic valve lifter. Oil enters each lifter through grooves and holes in the lifter body and the plunger. See figure 2-12 and 2-13. Rocker Arms, Valves, and Push Rods. 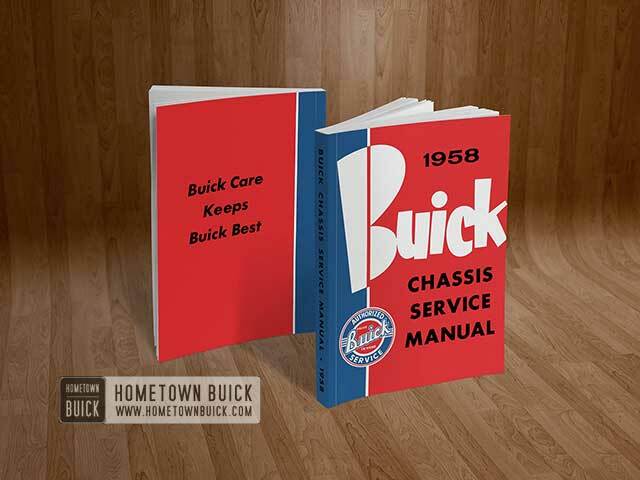 The 1958 Buick rocker arms and valves on each cylinder head are supplied with low pressure oil from the valve lifter oil gallery through connecting passages drilled in the front end of cylinder block and head. See figure 2-13. The oil passage in cylinder head ends in a counterbored recess surrounding the bolt which attaches the rocker arm shaft front bracket. The oversize bolt hole through the bracket permits oil to flow up into the hollow rocker arm shaft, which is plugged at both ends. Each 1958 Buick rocker arm receives oil through a hole in the shaft, and parallel grooves in the rocker arm assure proper lubrication of the bearing surface. Oil is metered to the push rod ball seat and to the valve stem through holes drilled in the rocker arm. Excess oil drains off and returns to the oil pan through passages in cylinder head and cylinder block. The 1958 Buick crankcase is ventilated by means of suction provided by a ventilator pipe which projects down under the car. Air passing the open end creates a suction when the car is moving forward. Air is drawn in through two ventilating type filter caps, located at the top center of each rocker arm cover. The air spreads out, ventilating the entire rocker arm area before being drawn down through the push rod holes in the heads. The air, well distributed by the push rod holes, enters the crankcase and then flows to the rear and upward to enter the breather filter. The metal gauze filled breather filter is built into the rear end of the lifter cover to remove oil from the air stream before it leaves the crankcase. The air flow is reversed by baffles in the filter, thereby separating the oil which then drains back through a hole in the rear of the filter. After the oil is removed, the ventilating air is drawn down and out through the ventilator pipe. 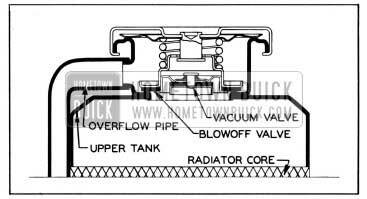 The 1958 Buick engine cooling system is the pressure type, with thermostatic coolant temperature control and water pump circulation. A thermogauge to indicate temperature of coolant is mounted on instrument panel. The gauge assembly includes a capillary tube with a bulb which attaches to the left cylinder head so as to extend into the water jacket. A Harrison tube and fin type radiator core of copper is used on all models. On Dynaflow equipped cars the lower radiator tank houses the Dynaflow oil cooler. A sheet metal shroud mounted on the rear side of the radiator core controls the flow of air through the 4-blade fan and prevents air from circling back around the outside of the blade tips. By eliminating recirculation of air the shroud improves the idling and low speed cooling without affecting the high speed cooling efficiency. A constant speed for drive and a 5-blade fan is used on air conditioner equipped cars. The cooling system is sealed by a pressure type radiator filler cap which causes the system to operate at higher than atmospheric pressure. The higher pressure raises the boiling point of coolant and increases the cooling efficiency of the radiator. The fifteen pound pressure cap used on all series permits a possible increase of approximately 38° F. in boiling point of coolant. The pressure type radiator filler cap contains a blow off or pressure valve and a vacuum or atmospheric valve. See figure 2-15. The pressure valve is held against its seat by a spring of pre-determined strength which protects the radiator by relieving the pressure if an extreme case of internal pressure should exceed that for which the cooling system is designed. The vacuum valve is held against its seat by a light spring which permits opening of the valve to relieve vacuum created in the system when it cools off and which otherwise might cause the radiator to collapse. The coolant is circulated by a centrifugal water pump mounted on the timing chain cover which contains the outlet side of the pump. The fan and pulley are mounted on the outer end of the pump shaft so that the pump and fan are driven by a belt from a pulley on the crankshaft. The pump shaft is incorporated in a double row ball bearing which is sealed at both ends to exclude dirt and water and is lubricated during manufacture so that no further lubrication is required. The pump is sealed against leakage by a packless non-adjustable seal assembly mounted in the pump cover in position to bear against the hub of impeller. See figure 2-16. The inlet pipe cast on the pump cover feeds into the passage formed by the cover and the front face of the impeller, which is mounted on the bearing shaft with the vanes facing rearward. Coolant flows through the inlet passage to the low pressure area at the center, where it then flows rearward through three holes in the impeller. Vanes on the rotating impeller cause the coolant to flow radially outward into two discharge passages cast in the timing chain cover, and these passages deliver an equal quantity of coolant to each cylinder bank water jacket. Cylinder water jackets extend down below the lower limit of piston ring travel and the coolant completely surrounds each cylinder barrel to provide uniform cooling. 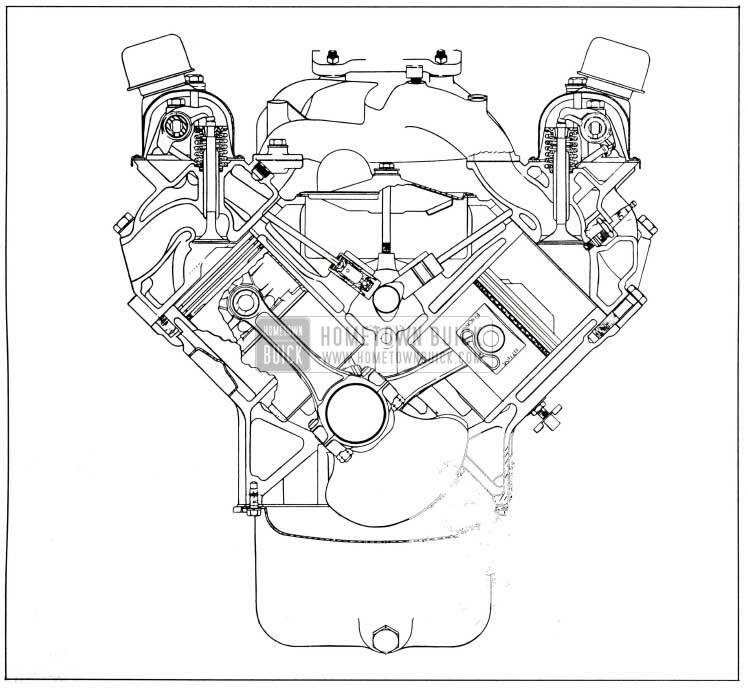 After flowing upward through connecting passages the coolant leaves the cylinder heads through a water manifold that provides a common connection between both heads and the radiator. The water manifold also houses the “pellet” type radiator thermostat and provides the bypass passage through which coolant returns to the water pump for recirculation whenever the thermostat valve closes to block circulation through the radiator. This thermostatically operated by-pass type of water temperature control permits the 1958 Buick engine to reach its normal operating temperature quickly. 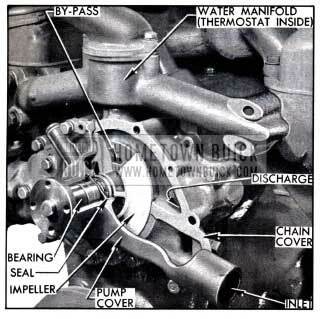 The thermostat valve opens at 157-162 degrees F.
The vacuum pump is mounted to, and integral with, the 1958 Buick engine oil pump, located in the crankcase oil sump. The vacuum pump is a vane type, consisting of a rotor and two spring loaded non-metallic vanes encased in a housing. A portion of this die-cast housing also serves to house the oil pump inlet screen and passage. See figure 2-10. The vacuum pump rotor is driven by the oil pump idler (driven) gear by means of a key that extends through a common pump end cover. The vacuum passage is a drilled hole in the oil pump body which matches a drilled passage in the cylinder crankcase, terminating in a fitting located just to the rear of the oil filter, outside the crankcase. From this point tubing extends up the rear of the 1958 Buick engine to connect to the windshield wiper vacuum system. Air that enters the vacuum pump during windshield wiper operation is discharged into the crankcase.